After two fails on me with Paco Rabanne, I had to wonder why I keep coming back to the brand since nothing they put out really interest me. 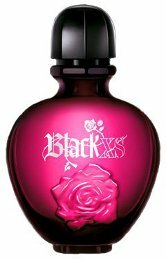 Black XS has an enormous rose on the bottle which made me a bit leery about what I would get. In Bottle: Slightly woody, creamy scent with a dish of flowers and some slightly tart berries. Applied: On application, it almost smells like Christmas dinner. You know with the festive spicy smell and the little bit of cranberry? There’s sweetness in here almost immediately and it’s a pleasant little party. I admit, it is a little weird to feel like it’s Christmas all the way in July but hey, it’s fascinating at least! But Black XS quickly sheds its festive cheer and heads into a fairly banal floral mid-stage with a creamy and rich cocoa note adding a bit of interest to it. So far I’m pleased with the cocoa but pretty bored with the floral mid-stage that pretty much adds nothing new or interesting. I get more woods in the dry down, the cocoa note is still present and there’s always that looming sweetness that stuck around. Black XS lacks in a lot of departments and originality is one of them. I’m not all that pleased with this unfortunately. Extra: Black XS was clearly not for me as it is marketed toward a young audience with a specific taste. I like to call them the Flowerbomb demographic. Design: The bottle for Black XS is actually pretty nice–until you get to the huge rose on the glass then everything just kind of focuses there. I suppose that’s what they were going for and I suppose the demographic might appreciate the design but I don’t particularly like it. Notes: Cranberry, pink pepper, violet, rose, cacao, patchouli, vanilla, woods. So I didn’t have a really bad reaction to Black XS. It was all right but like I said, there’s nothing original or interesting about this. It’s definitely wearable but it’s not at all artistic. Reviewed in This Post: Black XS, 2010, Eau de Toilette. This entry was posted in floral, gourmand, paco rabanne, Reviews By House and tagged cacao, cranberry, patchouli, pink pepper, rose, vanilla, violet, woods. Bookmark the permalink.